Just minutes from Dulles Airport, outside Washington, D.C.
Groups $8 for 8 or more, with advanced registration. Congratulations to our 2019 exhibiting artists. To see the list of artworks, click here. We are planning workshops, bus tour to DC, lectures, Quilt Alliance conference, SAQA pARTy, Dinner and more. Mark your calendars now. We are pleased to have Deborah Boschert joining us for the weekend to offer several inspiring workshops and lectures. 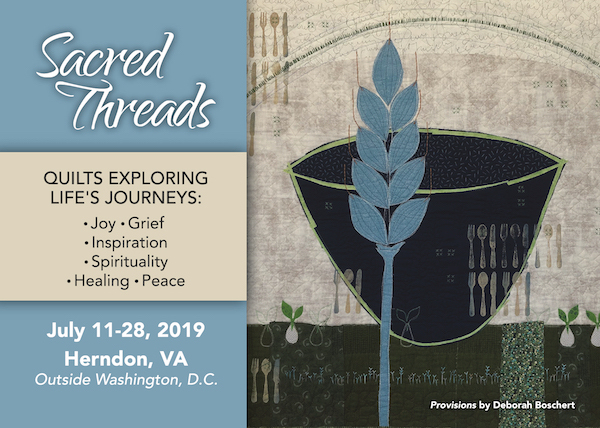 Thinking about coming to the Sacred Threads Experience Weekend? 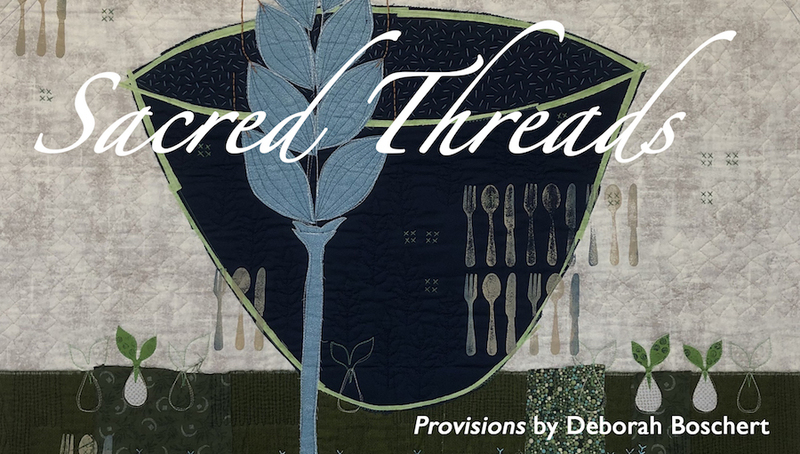 Learn more about Deborah and her plans to be with us at Sacred Threads. Thanks to Barbara Hollinger, Karol Kusmaul and Laurie Ceesay for these early samples. All artworks will be accepted and will be a part of this meaningful exhibit. We need your help to spread the word. Thank you to eQuilter.com for being the sponsor of our traveling exhibit! Click Here to View a Slideshow of our Tentative 2019 Travel Exhibit. If so, please start your shopping at smile.amazon.com and choose Sacred Threads as your designated charity. Why not make all your purchases support a good cause! Sacred Threads is an exhibition of quilts exploring themes of joy, inspiration, spirituality, healing, grief and peace/brotherhood. This biennial exhibition was established to provide a safe venue for quilters who see their work as a connection to the sacred and/or as an expression of their spiritual journey. The objective is to create a dignified exhibition of artwork that touches on both spiritual and personal levels all those who view it. We want to share with others the experiences of quilters whose stories may be a source of healing and strength. Entries to Sacred Thread Exhibitions are juried in by images for purposes of space and suitability of theme only. Works are not judged. Sacred Threads is a 501(c)3 and appreciates the support of our donors. To make a tax deductible donation online, use your credit card or PayPal account.